You are here: Home » Monty Python are back! Monty Python are back on the big screen. This time with a special 40th anniversary, sing-a-long version, of their greatest film. The Life of Brian, sorry The Search for the Holy Grail. For one day only, you can see and sing with the classic film. Not only that, please dress up and help get into the film even more! With that, we’ve been sent over not only the above poster, the below trailer but a third thing. A nice set of images from the film. Showing death and destruction. Not only that very little running away! The screening will be accompanied by a specially filmed, exclusive, introduction from Terry Jones, Terry Gilliam, Michael Palin, Eric Idle and John Cleese. We want to make this a fun event and are encouraging audiences to come along dressed up as their favourite character. There will also be an interactive social media campaign in the lead up to the release. 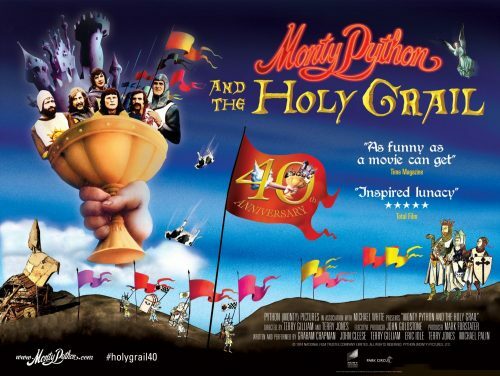 Sony Pictures Home Entertainment will also celebrate the 20th Century’s most brilliant and outrageous comedy troupe with the MONTY PYTHON AND THE HOLY GRAIL: 40th ANNIVERSARY EDITION Blu-ray™ in autumn.